^ 1.0 1.1 Schlesinger, Arthur M. "Historians Rate the U.S. Presidents" Life November 1, 1948: 65-66, 68, 73-74. ^ 3.0 3.1 Americans Say Reagan Is the Greatest U.S. President. Gallup.com. [2012-03-16]. ^ Schlesinger, Arthur M. "Our Presidents: A Rating by 75 Historians." New York Times Magazine July 1962: 12-13, 40-41, 43. ^ 8.0 8.1 Rating the Presidents: Washington to Clinton. [2010-03-25]. ^ HISTORIANS GIVE GOOD GRADES TO CLINTON PRESIDENCY IN SIENA COLLEGE SURVEY. January 11, 1995. Archived June 28, 2006. ^ FDR America’s Greatest President August 19, 2002. Archived February 10, 2007. ^ C-SPAN Survey of Presidential Leadership - Survey Participants. [2012-08-21]. （原始内容存档于2011-02-09）. ^ C-SPAN Survey of Presidential Leadership. [2012-08-21]. （原始内容存档于2014-07-22）. ^ Lincoln Wins: Honest Abe tops new presidential survey. CNN. 2009-02-16 [2010-10-30]. ^ Griffin, Jeremy; Nico Hines. Who's the greatest? The Times US presidential rankings. The Times (London). 2008-10-28 [2010-03-24]. ^ Presidential Leadership; The Rankings. Wall Street Journal Online. September 12, 2005. （原始内容存档于February 7, 2006）. 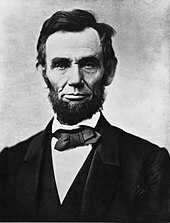 ^ Lincoln Wins: Honest Abe tops new presidential survey. CNN. February 16, 2009 [October 30, 2010]. 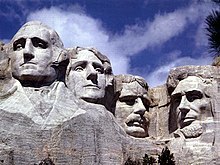 ^ "Rushmore Plus One; FDR joins Mountainside Figures Washington, Jefferson, Teddy Roosevelt and Lincoln as Top Presidents" 互联网档案馆的存檔，存档日期July 7, 2015，.. Siena Research Institute. July 1, 2010. ^ Thomas, G. Scott. Clean sweep for the Roosevelts. Business First of Buffalo. July 1, 2010 [September 1, 2010]. ^ Iwan Morgan. "UK Survey of US Presidents: Results and Analysis". Retrieved October 10, 2013. ^ Brandon Rottinghaus. Measuring Obama against the great presidents. The Brookings Institution. February 13, 2015. ^ Azari, Julia. Our Worst Presidents Came In With A Lot Of Experience. fivethirtyeight.com. Nate Silver. [November 27, 2016]. ^ Presidential Historians Survey 2017. C-SPAN. [February 17, 2017]. ^ Life Portraits. American Presidents. [2012-03-16]. ^ Presidents & History. Pollingreport.com. 2000-01-26 [2010-10-30]. ^ Washington College | Search the Washington College Site (PDF). Starrcenter.washcoll.edu. [2010-10-30]. （原始内容 (PDF)存档于2008-06-25）. Bailey, Thomas A. Presidential Greatness: The Image and the Man from George Washington to the Present. New York: Appleton-Century. 1966. → A non quantitative appraisal by leading historian. Bose, Meena; Landis Mark. The Uses and Abuses of Presidential Ratings. New York: Nova Science Publishers. 2003. ISBN 1590337948. → A collection of essays by presidential scholars. DeGregorio, William A. The Complete Book of U.S. Presidents 4. ed., rev., expanded, and up-dated. New York: Barricade Books. 1993. ISBN 0942637925. → Contains the results of the 1962 and 1982 surveys. Faber, Charles; Faber, Richard. The American Presidents Ranked by Performance. Jefferson, NC: McFarland & Co. 2000. ISBN 0786407654. Felzenberg, Alvin S. There You Go Again: Liberal Historians and the New York Times Deny Ronald Reagan His Due. Policy Review. 1997, 82: 51–54. ISSN 0146-5945. Holli, Melvin G. The American Mayor: The Best & the Worst Big-City Leaders. University Park, PA: Pennsylvania State Univ. Press. 1999. ISBN 0271018763. Miller, Nathan. Star-Spangled Men America's Ten Worst Presidents. New York: Scribner. 1998. ISBN 0684836106. Murray, Robert K.; Blessing, Tim H. Greatness in the White House: Rating the Presidents, from Washington Through Ronald Reagan 2., updated. University Park, PA: Pennsylvania State Univ. Press. 1994. ISBN 0271010894. Pfiffner, James P. Ranking the Presidents: Continuity and Volatility (PDF). White House Studies. 2003, 3: 23. ISSN 1535-4768. Ridings, William J., Jr.; McIver, Stuart B. Rating the Presidents: A Ranking of U.S. leaders, from the Great and Honorable to the Dishonest and Incompetent. Secaucus, NJ: Carol Publishing. 1997. ISBN 0806517999. Schlesinger, Arthur M., Jr. Ranking the Presidents: From Washington to Clinton. Political Science Quarterly. 1997, 112 (2): 179–190. doi:10.2307/2657937. Skidmore, Max J. Presidential Performance: A Comprehensive Review. Jefferson, NC: McFarland & Co. 2004. ISBN 0786418206. Skidmore, Max J. Ranking and Evaluating Presidents: The Case of Theodore Roosevelt. White House Studies. 2001, 1 (4): 495–505. ISSN 1535-4768. Taranto, James; Leo, Leonard. Presidential Leadership: Rating the Best and Worst in the White House. New York: Wall Street Journal Books. 2004. ISBN 0743254333. → For Federalist Society surveys. Vedder, Richard; Gallaway, Lowell. Rating Presidential Performance. (编) Denson, John V. (ed.). Reassessing the Presidency: The Rise of the Executive State and the Decline of Freedom. Auburn, AL: Ludwig von Mises Institute. 2001. ISBN 0945466293. Eland, Ivan. Recarving Rushmore: Ranking the Presidents on Peace, Prosperity, and Liberty. Oakland, California: Independent Institute. 2009. ISBN 1598130226.